With Procemex® Dirt Count Analyzer you can improve the pulp production process in and reduce customer claims arising from shives and dirt in pulp. Inspected web area is up to 100 % of total production. Dirt classes comply with ISO5350-2 and TAPPI/ANSI T563 standards. Camera pixel resolution of 0,1 mm: even smallest dirt is caught accurately under all conditions. An easy and illustrative graphical user interface. Compact inspection beam fits smallest machine positions. Connection with bale tracker systems. The Procemex® Dirt Count Analyzer is an online measurement system. It detects and classifies dirt and shives according to ISO and TAPPI standards providing both dirt count per square meter and dirt area per square meter (ppm). Dirt that does not qualify a dirt according to the standard is rejected from the calculation. Beyond standards, some objects like metal wires, oil and special particles relating to different raw materials are detected and classified based on their shape. The Procemex® Dirt Count Analyzer is measuring in transmission with strobe LED lights with the camera resolution of 0.1 x 0.1 mm to meet TAPPI/ISO standards. You can choose between full CD/MD coverage or one camera per bale or just few measurement points. The Procemex® Dirt Count Analyzer detects dirt in real time and stores every defect individually into the system database. The system keeps operators up to date with the amount of defect per set, per bale and per time. The amount of dirt in each bale is indicated both in real time values and with color coding. Operators can monitor real time dirt count trends indicating process changes and enable fast corrective reaction. The dirt count values are transferred to the customer quality data management and bale tracking systems providing an easy access to any of the historical information. The customer had an existing system. 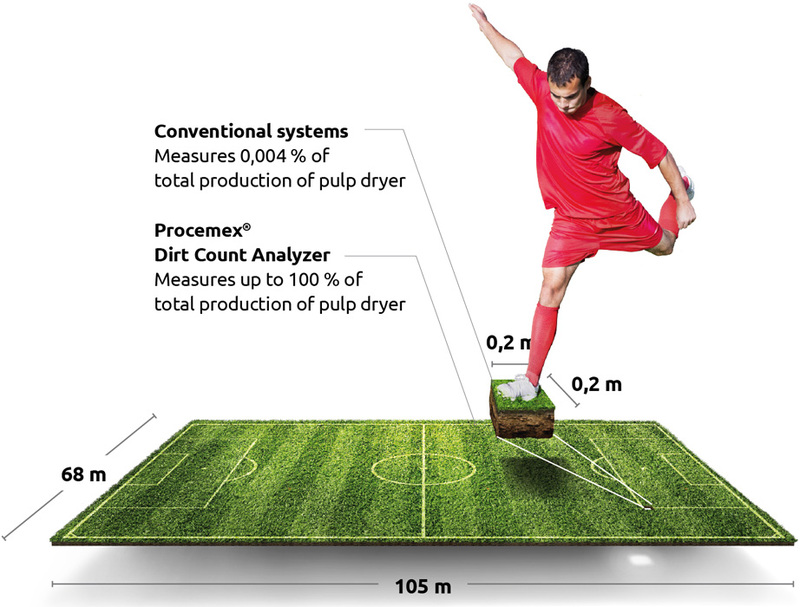 The 'black box' type of a system provided a dirt count number from one measurement spot. Their current system was getting old, and there were issues with support and spare part availability. They wanted a modern online Dirt Count Analyzer with a classification function that complies with the ISO-5350-2 specification. Provided a system based on Procemex 2.1 Mpix smart cameras and strobe LED light technology. Same type of cameras and lights were already in use on one paper machine at the mill. Procemex strobe LED lights easily penetrated the hardwood pulp and produced crystal clear and extremely detailed images and measurement. Procemex® Dirt Count Analyzer measures 3 out of 7 bales. As the measurement frame reaches already across the machine, it is easy to add cameras and measure all bales later on – if needed. The system’s simple yet advanced design solutions offer unlimited potential for customization. In addition to quality data transfer, Procemex® Dirt Count Analyzer is widely accessible from other mill systems via various links and database view - connections. The most cutting-edge advantage the customer experienced was the early discovery of defects. This allowed their operators to take fast actions, which ultimately resulted in more efficient production and improved quality.